Greetings from Blizzard Entertainment’s University Relations Team Just a friendly hello and update from Blizzard’s University Relations team. We have some exciting news to share! We also want to thank you for your continued support and promotion of Blizzard Entertainment’s University Relations and Internship programs to your student community. If you are not interested in being a part of this email list or if there is someone you feel we should add, please respond to this email. If your students have any questions, please direct them to our University Relations webpage, Blizzard Careers Twitter feed, or our new LinkedIn Group! About us: Blizzard’s University Relations team consists of Mike Perry (Manager, Global Talent Acquisition Programs), Cat Kocher (Senior Programs Specialist, University Relations), and Janine Tedford (Programs Specialist, University Relations). Summer 2014 Internships are now live So many exciting opportunities – programming, writing, design, art, business operations, and more. For the first time, we’re offering internships in our Austin, TX office! There are still plenty of opportunities in Irvine. We look forward to seeing applications from your students. Due to the high volume of applications, please do not have students contact us directly. We will notify students of their application status before April 2014. Application deadline: January 31, 2014 New way for students to connect with us We recently launched a LinkedIn Group just for University Relations! Students and faculty are welcome to join the discussion here. We’ll post news in this space regularly, as well as respond to questions submitted by the community. We look forward to sharing a lot of content that will be helpful to students who want to break into the industry and understand what it takes to get a job at Blizzard! Please encourage your students to follow us here, submit their questions, and read through the resources provided. We’re still on Twitter too if you ever need a Blizzard Careers quick fix. The University Relations team is growing To meet the growing demand for student talent, Blizzard’s University Relations team is expanding too! Mike Perry joined Blizzard this past summer as Global Talent Acquisition Programs Manager, overseeing University Relations. One of our teammates – Cat Kiengsiri (formerly Cat Kocher) – will be relocating to the east coast in December to focus on partnering with and visiting campuses along the Atlantic. Janine Tedford will continue to be the point of contact for campuses on the west coast. We’re searching for a new Specialist, based out of our Austin location. The position is currently posted on our website; please feel free to forward it to any contacts you have that are looking for a new opportunity! Middle school student in Beverly Hills needs an Algebra tutor for 90 minute sessions once or twice a week. Will pay $40-$50 per session based on experience. Email Amy at jacksonirving@aol.com with education history and tutoring experience. The Information Assurance Internship is a paid research internship open to ROTC cadets, CyberCorps SFS students, and civilians. We are currently accepting applications from exceptional students (juniors & seniors) due to graduate in Dec 2014 or May 2015. At Amazon, we strive to be Earth’s most customer-centric company where people can find and discover anything they want to buy online. Amazon’s evolution from Web site to e-commerce partner to development platform is driven by the spirit of innovation that is part of our DNA. As a new college graduate, you will have multiple opportunities to innovate and solve complex technical and business problems as you join us on this growth journey. The work environment is fast – paced and continually evolving as Amazonian’s are passionate about ownership and delivering results for the company. We hire the brightest minds from the best universities globally and have various career opportunities available for undergraduate and advanced degree students. If you are interested in working in an environment that will challenge you to relentlessly improve the experience for our customers, where one day will be very different from the next and where your learning never stops, Amazon has multiple work opportunities available for students with diverse academic backgrounds. What You Need to Know: Apply online today! Intern and full-time positions are posted. A current computer science students to tutor high school AP computer science Java off campus in Santa Monica area. Good pay, weekdays after 4pm or weekends. Please email me at cwangrubin@yahoo.com or call me at 310-3820636. We are an independent firm of designers, planners, engineers and technical specialists offering a broad range of professional services. We are reaching out to local universities, to educate students on our company and provide full time graduate opportunities for students. We are hosting an immersion and inclusion event in our LA office at the beginning of November. These events typically result in a number of hires and are a great way to learn about the company and positions. Please see the attached flyer for additional details. The event is by invitation only and we’re asking students to submit their resumes as soon as possible to be considered. The day includes the opportunity to interview for a full time position in our LA office. Please forward to anyone who may be interested and be sure to apply before October 11th. What You Need to Know: You must submit you resume before hand to be invited to the event. Apply before October 11th See attached flyer! Evening with Industry (EWI) is an annual event hosted exclusively by SWE at Covel Commons’ Grand Horizon Ballroom during winter quarter. During this event, students have the unique opportunity of sitting and enjoying a wonderful dinner with participating company representatives to explore and understand the industry and their company. A private career fair directly follows to facilitate immediate communication between students and representatives for the common goal of hiring students for a full-time/part-time job or internship. This is your chance to be one of the few to assist in planning and hosting one of the largest professional events hosted by students in HSSEAS. Don’t miss this opportunity to connect with recruiters behind the scenes and to work with and get involved with SWE. The positions currently open: -Programs -Design/Medi a -Assistant -Guest Logistics -Publicity DEADLINE: Friday | October 11, 2013 @ 11:59PM Application attached to this email. What You Need to Know: DEADLINE: Friday | October 11, 2013 @ 11:59PM Application attached to this email. Hitachi Consulting is a business strategy and technology solutions firm. We’re conducting on-campus recruiting for our full-time positions this fall. We offer some great opportunities for students pursuing a career in consulting or technology, and we’re really excited to bring some new Bruins into our SoCal offices. Information about positions within the company, and about on-campus recruiting timeline is attached. What You Need to Know: Infosession: Career Center, 3rd Floor, 6:30-8:30pm Representatives will also be at the Engineering and Technical Career Fair, October 22nd Flyer attached! Thursday, November 7, 2014, 4-7pm, UCLA Career Center Are you considering taking time off before you enter graduate school or begin your career? Do you want to travel, study a language, have an enriching summer opportunity or engage is social service? Perhaps you are looking for a formal training internship to learn more about a career. Whether a few months or a year or more, there are so many choices for a ‘GAP Year’! Please come to our Gap Year JumpStart Program to learn about the many diverse opportunities that await you. Hear from program leaders and begin brainstorming your own ‘GAP Year’ adventure! Participants at this program will include representatives from Disney, City Year, and the Coro Fellows Program. Register online today at career.ucla.edu/JumpStart *The JumpStart Series© is a fee-based program only open to currently registered UCLA students. The $20 fee will be charged to your BAR account upon registration. We are located in the Strathmore Building near parking structure eight (career.ucla.edu/Directions and/or career.ucla.edu/HowToFindUs). For Frequently Asked Questions (such as “Is there a dress code?”) go to career.ucla.edu/JSJSFAQs. How to Apply? Please send your resume (max. 2 pages) and cover letter to career@patexia.com. Please include the Req. No. in your cover letter and email subject. We will review your application and may invite you for a 30 min phone interview subsequently followed by 2+ hours in person interview. There will be case questions (e.g. estimation, strategy, patent evaluation, …) during the interview. We have openings for 2 positions (entry level product development engineer and senior product development engineer). We are looking for applicants with a B.S. or Ph.D in the following departments: B.S. in Mechanical, Materials, Aerospace, Chemical, or Biomedical Engineering (Fall or Spring graduates) Ph.D. in Mechanical, Materials, Aerospace, Chemical, or Biomedical Engineering (Fall or Spring graduates) I have attached job descriptions for both the entry level and senior positions. Would you mind helping me to forward this to the appropriate parties in the other departments? Also, let me know if in the future you’d like to continue receiving these emails or if there is someone in human resources or elsewhere I should be sending these to. Thank you for your time! I’m a UCLA graduate working at a great company, the Rubicon Project. At this moment, we have a huge needs for Software Engineers. We now have multiple openings and we’re open to any location in SF, Seattle, LA, or even NY! Here’s a list of the current openings: User Interface Engineers (multiple positions) Java Script, HTML, CSS, Software Development Engineers in Test /QA Engineers (multiple positions) Automation, Python Big Data Engineers (two positions) Java, Hadoop, MapReduce Please feel free to share this within HSSEAS. Please have interested candidates send me their resume and LinkedIn profiles. Please visit http://www.rubiconproject.com/join-us/ for more details. As a registered investment advisory firm, Wells Capital Management focuses on managing equity, fixed income and blended portfolios for a variety of institutional clients. As an analyst in the development program you will spend 24 months as a participant in one of the following three tracks: Investment Management, Business Management and, Technology. Joel Carlson, Chief Technology Officer will be on campus October 8 interviewing students! Deadline to apply via the career center is September 24. Any questions about the program, please contact Pamela Voelz at 414-577-7417 or pamela.voelz@wellscap.com What You Need to Know: Make sure you sign-up through the Career Center by September 24th! System Validation Intern – Job Description and Requirements Responsibilities This System Validation Intern position is within Network Division’s Network Platform Solutions group. The team is responsible for performing system integration and validation for network switch platforms providing L2/L3 functionality and Open Flow support. In this position, your responsibilities will include, but not be limited to: • Developing system level test plans • Defining test cases • Developing test scripts • Performing manual and automated testing • Analyzing test results and helping with issue investigation and characterization Qualifications Applicant should be at least at college sophomore level, currently enrolled in college and pursuing a Bachelor/Master of Science degree in Computer Engineering or Computer Science. Required skills and experience include: • Programming experience in PERL and C languages • IP Networking experience, including some knowledge of Layer 2 and Layer 3 switching • Demonstrated ability to work and solve problems independently or with minimal supervision • Excellent English writing skills and verbal communication skills • Hands-on experience with network switches and routers Additional desired skills, experience, and interests: • Familiarity with network routing protocols such as OSPF, RIP, and BGP • Test Plan, Test Case, and Test Script Development experience • Testing and troubleshooting/debugging skills • Experience using Linux and Ixia/Spirent test equipment • Organized and detail oriented, taking the initiative to investigate and document anything that doesn’t seem right in the product behavior, even if it may seem to be a fluke • Interested in testing network components The location is in Calabasas and it can be a part time position of at least 20 hours per week or more, running through the school year. On-Campus LabVIEW workshops starting on Wednesday of 2nd week! Hitachi Consulting is currently recruiting for its Inspiration Consulting Summit, a 3-day conference (Jun. 19-21) that introduces undergraduate students to careers in consulting. During the program, students will travel to our headquarters in Dallas to work with college peers from across the country; exploring and practicing the teamwork, collaboration, and communication skills that are considered foundational capabilities for consultants. Additionally, they will have an opportunity to interact with Hitachi Consulting leaders and employees to gain insight into the work performed by Hitachi Consulting consultants on real consulting projects. We hope that as participants in the Summit, students will have an opportunity to develop valuable connections with business and student leaders across the country, and be better able to define their post college career goals. 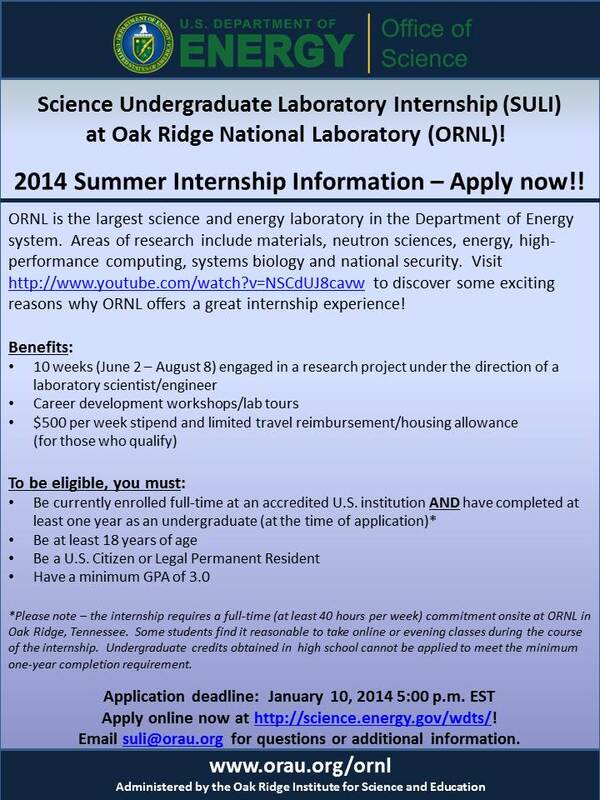 summer internship opportunity in Australia. The Charles “Pete” Conrad, Jr., Scholarship Program is sponsored by the Flight Path Learning Center of Southern California to encourage students to enter the field of aviation, aerospace or aeronautics. The scholarship is named in honor of Pete Conrad, NASA astronaut, commander of Apollo 12, and the third man to walk on the moon. Deadline: May 25, 2013 Scholarship Award: A $2,000 scholarship will be presented to the most qualified applicant. The award may be used for payment of tuition, books, fees and other educational expenses. The award of $2,000 will be sent directly to the recipient’s choice of educational institution (i.e., community college, four year college, university, technical school, etc.). If the awardee withdraws from the academic program with a tuition refund, the Flight Path Learning Center will receive the refund. Scholarship recipients from previous years are eligible to reapply. Requirements: All applicants must: 1. Be eligible to apply for full-time study in an accredited school (community college, four year college, university, technical school, etc.) leading to a degree or certificate in aviation, aerospace, aeronautics or physical science studies that relate to aviation, and plan on attending school no later than the next academic school year. 2. Be a United States citizen or a permanent legal resident. 3. Reside in Southern California. 4. Have demonstrated or expressed a genuine interest in a career in aviation, aerospace or aeronautics. For example, membership in aviation explorer scouts, member of an aviation or aerospace club, attendance at an aviation or space camp, extracurricular aviation, robotics or engineering activities, a student membership in a professional engineering society, etc. Note: Examples of programs of study which apply to the diverse fields of aviation, aerospace or aeronautics are: aircraft architecture; mechanical, civil, aeronautical, aerospace, electrical and electronics; airport management; physical sciences, avionics; airframe and powerplant certificate; and air traffic control certificate. Other programs leading to careers with both military and civilian organizations requiring these educational backgrounds are also included. The ASCE LA GI Chapter invites senior level undergraduate and graduate students to apply for the 2013 ASCE LA Geo-institute scholarship towards continuing education and research in the geotechnical engineering field. Submission deadline: March 15th, 2013. The BCMB Department at UT-Knoxville will once again offer a special REU program for undergraduates interested in hands-on scientific research experience. The broad focus is on “sensing and signaling”. The team of REU faculty represent multiple modern scientific disciplines including cell biology, biochemistry, molecular biology, and computational biology. An amazing internship opportunity for an undergraduate engineering student who may also be interested in finance/business. The internship is with our sourcing and procurement group, but works with Walt Disney Imagineering, so they are looking for a student with an engineering background. Lockheed Martin Infosession 2 Dates!!! The Division of Nuclear Chemistry and Technology of the American Chemical Society (ACS) is sponsoring two INTENSIVE six-week Summer Schools in Nuclear and Radiochemistry for undergraduates. Funding is provided by the US Department of Energy. The deadline for applications is February 1. AWARDS Fellowships include a stipend of $4000, all tuition and fees, transportation to and from the Summer School location, housing, books, and laboratory supplies. Transferable college credit will be awarded through the ACS accredited chemistry programs at San Jose State University (7 units) or the State University of New York at Stony Brook (6 units). QUALIFICATIONS Candidates should be undergraduates with an interest in nuclear science who are presently in their sophomore or junior year of study at a US college or university. They should have completed at least two years of chemistry, one year of physics and one year of calculus. Applicants must be US citizens. Please consult http://chemistry.missouri.edu/nucsummer/index.shtml for more information. Candidates should be May 2013, graduates seeking fulltime employment beginning June 2013. The Jumpstart Series An enriching Program to help you develop the winning edge towards your goals. Don’t miss out and consider registering for more than one program. The program is open to currently registered UCLA students and fee-based at $20 per session charged to you BAR account. -Initial deadline is Feb 12. Late applications will be considered on a space available basis. -Previous program participants need not submit letters of recommendation. Previous program applicants who did not participate need to submit a full application. We do not keep old applications. -Statement of purpose should mainly discuss which projects the student wishes to participate in.